My last race was on June 9th and I've been so busy at work that I haven't finished posting the results. 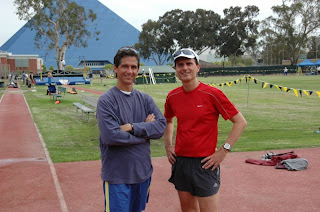 The race was Southern California Masters Track & Field Championships held at California State University at Long Beach. 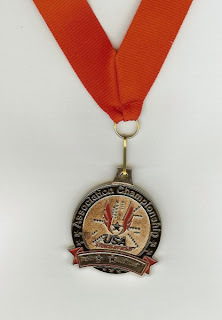 There was only racewalking event, a 5K, and 5 entries but one was a no show. I came in second overall, but one guy was disqualified and the other one was 21 years my senior. Pedro Santoni won the race and my age group, now that he's 50 it will be nearly impossible to win races. Here's Pedro and me after the race. Oh well, I'll be moving to Israel for the next two years for a job at The Animation Lab so I don't think I'll be entering any club races in a while! Although I was feeling pretty good, I wasn't completely recovered from the marathon I did earlier in the week. Oh well, at least I got in a few races before the craziness of finishing one job and starting the next--I haven't been able to work out since this race. All of my energy is going into my next adventure, two years in Jerusalem working on the first animated feature to be done in Israel--The Wild Bunch.